Brian K. Grodsky. 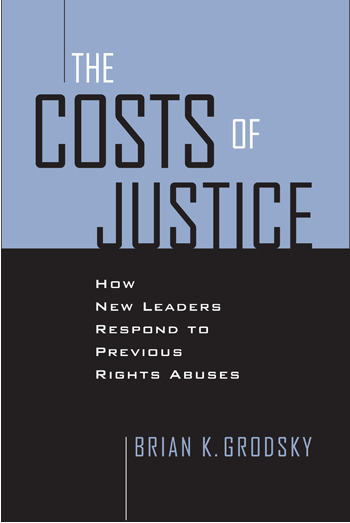 The costs of justice : how new leaders respond to previous rights abuses. University of Notre Dame Press, c2010. This book provides qualitative analyses of how transitional justice processes have evolved in diverse ways in post-communist states by examining the decision-making processes and goals of those actors who contributed to key policy decisions. The author challenges the argument that transitional justice in post-repressive states is largely a function of the relative power of new versus old elites and maintains that a new regime’s transitional justice policy is closely linked to its capacity to provide goods and services expected by constituents, not to political power struggles. 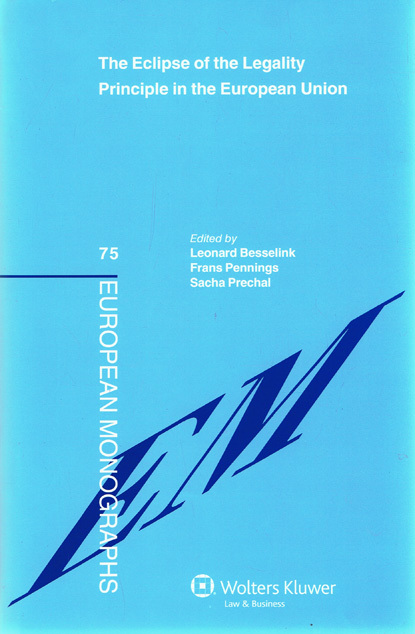 The eclipse of the legality principle in the European Union / edited by Leonard Besselink, Frans Pennings, Sacha Prechal. Aspen Publishers, c2011. The principle of legality protects the citizen against the arbitrary use of power and demands a legal basis to legitimize State action. This book exposes a spectrum of ways in which the traditional legality principle is under pressure in Europe because of the creation of new legal orders, including that of the EU, and the interaction between these new orders and the State. It also highlights other factors such as expertise driven governance, difficulties of international organizations to meet their objectives due to a lack of adequate powers, and lack of parliamentary control. Creating a world fit for children : understanding the UN Convention on the rights of the child / edited by Catherine Rutgers. International Debate Education Association, c2011. Douglas W. Kmiec, et al. The history, philosophy, and structure of the American constitution. 3rd ed. LexisNexis Matthew Bender, c2009. Richard T. McDermott. Legal aspects of corporate finance. 4th ed. LexisNexis Matthew Bender, 2006. Carolyn E.C. Paris. Drafting for corporate finance : what law school doesn't teach you. Practising Law Institute, c2007. Daniel E. Gospin, et al. Medical records law. Lorman Education Services, c2011. Ilona Bray. U.S. immigration made easy. 15th ed. Nolo, 2011. Robert H. Jerry II, Douglas R. Richmond. Understanding insurance law. 4th ed. LexisNexis Matthew Bender, c2007. Kenneth J. Vandevelde. Thinking like a lawyer : an introduction to legal reasoning. 2nd ed. Westview Press, c2011. Bruce R. Hopkins. Fundraising law made easy. John Wiley & Sons, c2009. Susan Saab Fortney. Lawyer and law firm disputes : problems and prevention. State Bar of Texas, c2010. Patricia A. Cain. Rainbow rights : the role of lawyers and courts in the lesbian and gay civil rights movement. Westview Press, 2000. Stephen Fishman. Home business tax deductions : keep what you earn. 7th ed. Nolo, c2010. Stephen Fishman. Tax deductions for professionals. 6th ed. Nolo, 2011. Twila Slesnick, John C. Suttle. Nolo's essential retirement tax guide : your health, home, investments & more. Nolo, 2008. Corporate governance and shareholder empowerment : hearing before the Subcommittee on Capital Markets, Insurance, and Government Sponsored Enterprises of the Committee on Financial Services, U.S. House of Representatives, One Hundred Eleventh Congress, second session, April 21, 2010.
International Criminal Court Review Conference, Kampala, Uganda, May 31-June 11, 2010 : a joint committee staff trip report prepared for the use of the Committee on Foreign Relations, United States Senate, One Hundred Eleventh Congress, second session, September 2, 1010. Civil rights challenges of the 21st century : a view from the states / United States Commission on Civil Rights, 2010. Germs, viruses, and secrets : government plans to move exotic disease research to the mainland United States : hearing before the Subcommittee on Oversight and Investigations of the Committee on Energy and Commerce, House of Representatives, One Hundred Tenth Congress, second session, May 22, 2008. The law of the land : U.S. implementation of human rights treaties : hearing before the Subcommittee on Human Rights and the Law of the Committee on the Judiciary, United States Senate, One Hundred Eleventh Congress, first session, December 16, 2009. Oversight of the Clerk, Sergeant at Arms, Chief Administrative Officer, and Inspector General of the House of Representatives : hearing before the Committee on House Administration, House of Representatives, One Hundred Eleventh Congress, second session, held in Washington, DC, Wednesday, April 28, 2010. Public policy issues raised by the report of the Lehman bankruptcy examiner : hearing before the Committee on Financial Services, U.S. House of Representatives, One Hundred Eleventh Congress, second session, April 20, 2010. The Cayman Islands and offshore tax issues : hearing before the Committee on Finance, United States Senate, One Hundred Tenth Congress, second session, July 24, 2008. FHFA oversight : current state of the housing government sponsored enterprises : hearing before the Subcommittee on Capital Markets, Insurance, and Government Sponsored Enterprises of the Committee on Financial Services, U.S. House of Representatives, One Hundred Eleventh Congress, second session, May 26, 2010. Examining the federal role in overseeing the safety of public transportation systems : hearing before the Subcommittee on Housing, Transportation, and Community Development of the Committee on Banking, Housing, and Urban Affairs, United States Senate, One Hundred Eleventh Congress, first session, on examining the federal role in overseeing the safety of public transportation systems, December 10, 2009. The state of the airline industry : the potential impact of airline mergers and industry consolidation : hearing before the Committee on Commerce, Science, and Transportation, United States Senate, One Hundred Tenth Congress, first session, January 24, 2007. 21st century biology : hearing before the Subcommittee on Research and Science Education, Committee on Science and Technology, House of Representatives, One Hundred Eleventh Congress, second session, June 29, 2010. Deployed federal civilians : advancing security and opportunity in Afghanistan : hearing before the Oversight of Government Management, the Federal Workforce, and the District of Columbia Subcommittee of the Committee on Homeland Security and Governmental Affairs, United States Senate, One Hundred Eleventh Congress, second session, April 14, 2010. Toyota gas pedals : is the public at risk? : hearing before the Committee on Oversight and Government Reform, House of Representatives, One Hundred Eleventh Congress, second session, February 24, 2010. Financial regulation : hearings before the Committee on Homeland Security and Governmental Affairs, United States Senate of the One Hundred Eleventh Congress, first session. Status of the DTV transition : 370 days and counting : hearing before the Subcommittee on Telecommunications and the Internet of the Committee on Energy and Commerce, House of Representatives, One Hundred Tenth Congress, second session, February 13, 2008. E-911 implementation : hearing before the Subcommittee on Communications of the Committee on Commerce, Science, and Transportation, United States Senate, One Hundred Eighth Congress, first session, March 5, 2003. Accounting and auditing standards : pending proposals and emerging issues : hearing before the Subcommittee on Capital Markets, Insurance, and Government Sponsored Enterprises of the Committee on Financial Services, U.S. House of Representatives, One Hundred Eleventh Congress, second session, May 21, 2010. Nomination of Hon. M. John Berry : hearing before the Committee on Homeland Security and Governmental Affairs, United States Senate of the One Hundred Eleventh Congress, first session : nomination of Hon. M. John Berry to be director, Office of Personnel Management, March 26, 2009. The United/Continental airlines merger : how will consumers fare? : hearing before the Subcommittee on Antitrust, Competition Policy, and Consumer Rights of the Committee on the Judiciary, United States Senate, One Hundred Eleventh Congress, second session, May 27, 2010. More security, less waste : what makes sense for our federal cyber defense : hearing before the Federal Financial Management, Government Information, Federal Services, and International Security Subcommittee of the Committee on Homeland Security and Governmental Affairs, United States Senate of the One Hundred Eleventh Congress, first session, October 29, 2009. The federal government's role in empowering Americans to make informed financial decisions : hearing before the Oversight of Government Management, the Federal Workforce, and the District of Columbia Subcommittee of the Committee on Homeland Security and Governmental Affairs, United States Senate, One Hundred Eleventh Congress, second session, July 15, 2010. Violent Islamist extremism, 2009 : hearings before the Committee on Homeland Security and Governmental Affairs, United States Senate of the One Hundred Eleventh Congress, first session. Nomination of W. Craig Fugate : hearing before the Committee on Homeland Security and Governmental Affairs, United States Senate, of the One Hundred Eleventh Congress, first session : nomination of W. Craig Fugate to be administrator, Federal Emergency Management Agency, U.S. Department of Homeland Security, April 22, 2009. Antitrust implications of American Needle v. NFL : hearing before the Subcommittee on Courts and Competition Policy of the Committee on the Judiciary, House of Representatives, One Hundred Eleventh Congress, second session, January 20, 2010. 2010 census : a status update of key decennial operations : hearing before the Federal Financial Management, Government Information, Federal Services, and International Security Subcommittee of the Committee on Homeland Security and Governmental Affairs, United States Senate of the One Hundred Eleventh Congress, first session, October 7, 2009. Nomination of Hon. Janet A. Napolitano : hearing before the Committee on Homeland Security and Governmental Affairs, United States Senate of the One Hundred Eleventh Congress, first session : nomination of Hon. Janet A. Napolitano to be secretary, U.S. Department of Homeland Security, January 15, 2009. S. 294 : the Passenger Rail Investment and Improvement Act of 2007 : hearing before the Subcommittee on Surface Transportation and Merchant Marine Infrastructure, Safety, and Security of the Committee on Commerce, Science, and Transportation, United States Senate, One Hundred Tenth Congress, first session, February 27, 2007. Oversight of federal efforts for rail and surface transportation security : hearing before the Committee on Commerce, Science, and Transportation, United States Senate, One Hundred Tenth Congress, first session, January 18, 2007. The present and future of public safety communications : hearing before the Committee on Commerce, Science, and Transportation, United States Senate, One Hundred Tenth Congress, first session, February 8, 2007.